Do-It-Yourself Vision Test - Willa Hisle, O.D. Use a ruler to measure in centimeters the blue bar at the top of the chart. Using the measured number, move the same number of feet away from your computer. For example, if the blue bar measures 5 centimeters, you need to stand 5 feet away. Cover one of your eyes and read the smallest line of letters that you can. Repeat the test by covering the other eye and once again reading the smallest line possible. If you are not wearing glasses or contact lenses, this result will be your "uncorrected" acuity. 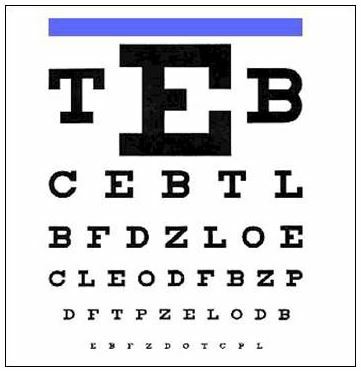 If you are wearing some type of correction, the results are your "corrected" visual acuity. Line 1: If you are only able to read the big E, your vision is approximately 20/200. If you can read the T & B, you are reading 20/100. Line 2: This line is approximately 20/50. Line 3: This line is ~ 20/40. You need to be able to read letters this size to pass the vision test for your drivers licence in California. ​Line 4, 5 & 6: These lines are 20/30, 20/20 and 20/10 respectively. Visual acuity in this range is considered to be "normal". This test is a self-screening test which is intended to give you an idea of what your distance visual acuity is. Several factors will effect the results of this test such as lighting, screen glare, and monitor quality. It may be helpful to change your screen size by zooming in (CTL +) or out (CTL -). Original Source: University of Illinois Eye & Ear Infirmary, 2009.